A UN investigating team has blamed the Assad regime’s forces for a third chemical attack in Syria’s conflict. The UN and the Organization for the Prohibition of Chemical Weapons assigned the responsibility in their fourth report in a 13-month enquiry. The report was submitted to the Security Council on Friday. 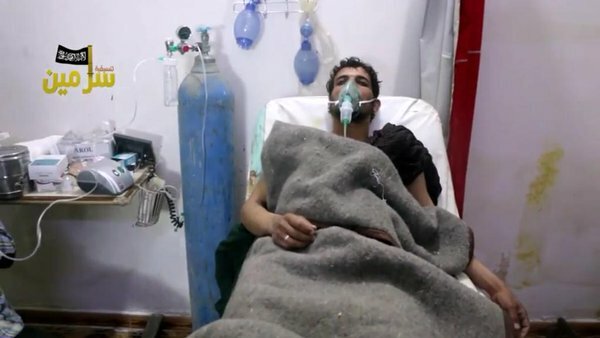 The investigators said the Syrian military used toxic gas in Idlib Province on March 16, 2015. The inquiry’s third report, submitted in August, found the regime responsible for two other chlorine attacks in Idlib Province — on Talmenes on April 21, 2014 and Sarmin on March 16, 2015. It also said Islamic State militants had used sulfur mustard gas. Evidence indicates the Assad regime has used chemical weapons in the Syrian conflict since 2012, with attacks with sarin nerve agent killing more than 1,400 people near Damascus in August 2013. However, previous UN teams have been prevented from assigning blame under guidelines set by the Security Council, which includes Assad’s ally Russia. After it was forced to hand over most of its chemical stocks and equipment, following the August 2013 attacks, the Syrian military began using chlorine, dropped in canisters inside munitions such as barrel bombs. Friday’s report found that helicopters had dropped barrel bombs with chlorine canisters. The flights came from the bases of the 253 and 255 squadrons with the 63rd helicopter brigade. The 618 squadron, with navy helicopters, was also located at one of the bases. The inquiry said that it “could not confirm the names of the individuals who had command and control of the helicopter squadrons at the time”, but insisted that those “with effective control in the military units…must be held accountable”. The investigation is considering nine attacks in seven areas of Syria where a separate OPCW fact-finding investigation determined that chemical weapons had likely been used.